Huge congratulations to our delegates Stephanie Cunningham (Pepsico) and Kevin Marley (Xerox) who achieved overall Joint BEST Candidate for the NEBOSH International Diploma during 2012/2013. This is a wonderful achievement for them (& SQT!!). A NEBOSH qualification is one of the most prestigious and highly respected International qualifications in Health and Safety. We are now taking bookings for our September course – a number of places have already been filled so book early to avoid disappointment. Why Risk Going Elsewhere for your NEBOSH Training? We’re Better than the Rest…we regularly exceed the overall NEBOSH exam pass rates year on year. Check out a detailed breakdown of our results to date. You can Trust us…we have been delivering NEBOSH training for the last 5 years and have helped dozens of people achieve their professional NEBOSH qualification – some even achieving the highest marks internationally!. Our Tutors are Tuned in…Our lead tutor Finbarr Stapleton has over 25 years of Health & Safety experience and is constantly engaged with industry today. We do Both…we are the only Irish training provider accredited by NEBOSH to deliver both the NEBOSH International Diploma & Certificate courses. Our course syllabi not only cover International legal frameworks and codes of practice but also Irish legislation. You Won’t Be on Your Own…our workshop structured course enables discussion and knowledge sharing with your peers throughout the duration of your training. Our Delegates Couldn’t be Happier…see what our Joint Best NEBOSH Candidate Stephanie Cunningham had to say – she’s a HSE Specialist with PepsiCo Ireland. Free Access to Legislation Software…book a place on this September’s course and receive FREE access for 3 months to the Pegasus Legal Register (created and maintained by Antaris Consulting). Why undertake the NEBOSH International Diploma over other H&S courses? It is the leading Health & Safety qualification for Health & Safety Professionals around the world. It is your first step to becoming a chartered Health & Safety Practitioner. You may apply for Graduate membership of the Institution of Occupational Safety and Health (IOSH) and full membership of the International Institute of Risk and Safety Management (IIRSM). It will provide you with a core of knowledge that is transferable across different occupational sectors around the globe. Last but by no means the least – there were 48 workplace fatalities reported in 2012 – many of which were preventable. This figure dropped from 54 in 2011and while the figure is heading in the right direction, – the Minister for Jobs, Enterprise and Innovation, Richard Bruton TD noted that ““Every workplace fatality is avoidable and represents a terrible tragedy for a family and a community, and combating workplace fatalities and injuries still represents a huge challenge for both the HSA and employers”. 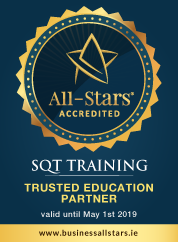 View a full course brochure here – or if you have any queries you can contact Eilish on 061 339040 or email ecummins@sqt.ie.